Nice blog. I should hire you to edit my blog. Wait a minute. I don’t get paid. Besides, maybe my crude uneducated style draws people to my blog. Could you please write a note on how to use this/that and these/those? English is not my mother tongue and I never know which one to choose between both. Your blog helps a lot and I am really eager to read more of your post to try and improve my English. This and these are used to describe items that are closeby. so if you’re standing right next to an item or items you could say “i like this lamp” or “i like these lamps.” That and those are to describe items that are farther away. like across the room or even across the country. this and that are fo singular items and these and those are for multiple items. does this make sense? And if it is something not mentioned before: is it “I’ll explain this later” or “I’ll explain that later.” ? Most often people will say “I already told you that”. There is nothing wrong though with saying “I already told you this”. If something is not mentioned before people say “I’ll explain it later.” I don’t know which language is your native language, but I do understand that many languages don’t have an it. I often hear attribute and contribute switched. I.e., “I’m contributing my success to my great command of English.” In writing the to, too, twos definitely get people bogged down. And I get lost in whether the period should come after or before the brackets (should I chance to use them). Great fast reply, thanks for that! Yeah I decided to give Ulysses a go at last. It’s meant to be the most difficult book to read ever! I read ‘A Portrait Of The Artist As A Young Man’ and completely loved it. Thanks so much for clearing up the grammar question; I’ve puzzled over that for ages. Glad to hear that I wasn’t completely wrong about it. Will come back to your blog because it’s great! Yes I live in England. I know this because, as I write, I can hear rain hitting the window and it’s mid-Summer!! There are some differences between English and American English I think. Or maybe it’s just a colourful (colorful) rumour (rumor). 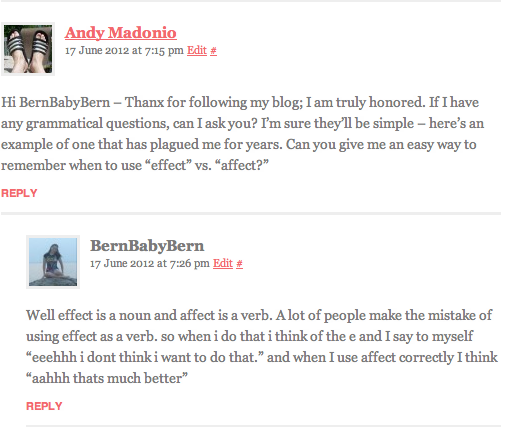 Hi, I saw you wrote a piece about effect and affect the other day and I can’t find it…. my boss just asked what’s the difference and I couldn’t remember which was the verb and which was the noun – despite your neat trick for it… can you please direct me in the right area? Also, another thing that drives me nuts is when people use ‘less’ instead of ‘fewer’…..any plans for that one?? Thanks! Hi there. So I have a word usage question. Would you say “habitable planet” or “inhabitable planet”? I think either, right? Thanks! Hello there, I’m an editor by trade so I don’t have any grammar questions. I do, however, love the blog. A bothersome mistakes that I see on a daily basis from professional writers: That and which. No one seems to get that one right. Also, very few writers actually seem to understand hyphenation rules for compound adjectives. OH, and using ‘over’ in a quantifiable context rather than a positional context (any time I see ‘over’ the writers almost always actually mean ‘more than’). Anyway, the reason I’m writing is because you followed my blog a long while ago and I thought I had followed yours, I just today noticed I hadn’t and I’ve since rectified the issue. I was reading over your blog just now and was wondering how you’ve, in such a short time, garnered so many followers, award nominations and hits that likely go along with it. Did you have another blog that was highly read before you started this one? Is it an SEO thing? Are you uber active on social media (something I will never be)? Forgive my ignorance, and thanks.